Does Inclusion of Aggregate in Concrete Increase Permeability? At first we will learn about theoretical effect of aggregate inclusion. Aggregate may be of highly permeable or of low permeable; let’s consider low permeable aggregate for concrete. 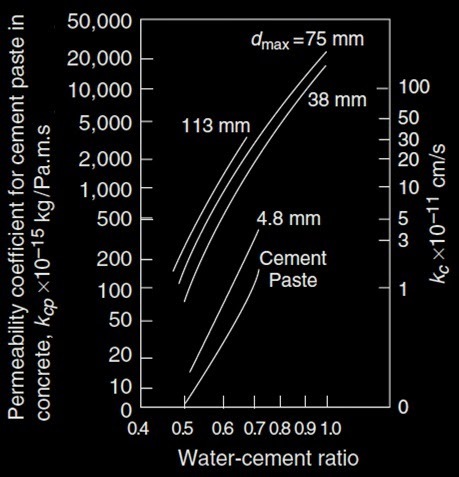 Cement paste in compare to aggregate is highly permeable especially in concrete of high water/cement ratio (at high capillary porosity at early age of hydration). The expected performance is- final concrete will be of low permeability. The theory behind this is- aggregate particles in the system provide an obstruction of flow channel within the matrix of cement paste. So it is expected that neat cement paste with respect to concrete or mortar have high permeability. Thus aggregate will be used with advantage. Is the practical situation are the some? The answer is definitely no. In practical field the inclusion of aggregate in cement paste or mortar results increasing permeability and also in significant degree. Low strength concrete defined above usually used for dam construction. 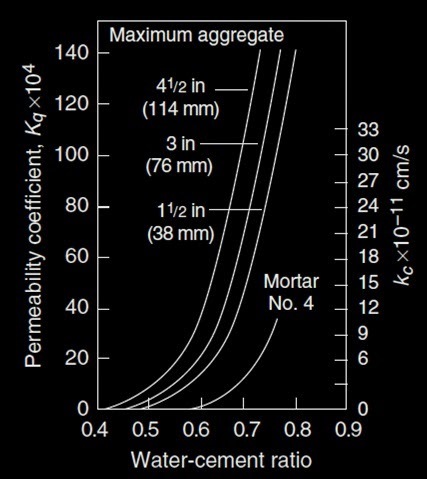 Influence of maximum aggregate size and w/c ratio on permeability of concrete shown below.